Q1. 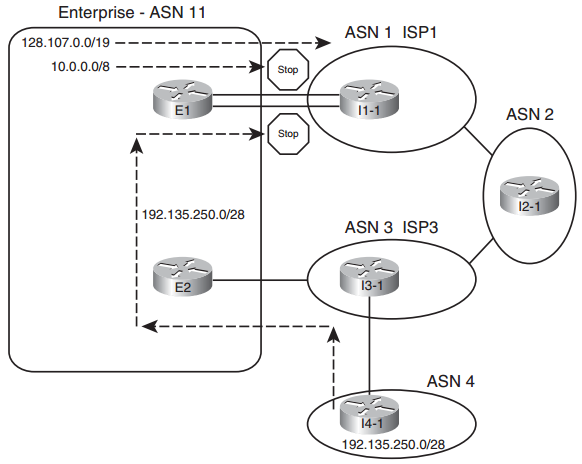 R1 in ASN 1 with loopback1 address 1.1.1.1 needs to be configured with an iBGP connection to R2 with loopback2 IP address 2.2.2.2. The connection should use the loopbacks. Which of the following commands is required on R1? Answer: C. R1 needs to be configured with router bgp 1, neighbor 2.2.2.2 remote-as 1, and neighbor 2.2.2.2 update-source loopback1. The neighbor 2.2.2.2 ibgp-multihop 2 and neighbor 2.2.2.2 ibgp-mode commands are simply unsupported commands. The neighbor 1.1.1.1 remote-as 1 command has correct syntax and is used as a command in R2’s configuration but not on R1. The neighbor 2.2.2.2 remote-as 2 command has correct syntax but with the wrong ASN (2 instead of 1). Q2. The following output occurred as a result of the show ip bgp command on Router R1. The output shows all BGP table entries on R1. How many iBGP-learned routes exist on this router? Answer: D. The small letter “i” in the third character position implies the route was learned with iBGP. Of the five lines, four have an “i” in the third column. c. The show ip bgp command lists a line for 190.1.0.0/16 with both an > and an i on the left. Answer: B and C. The line reading “1.1.1.1 from 2.2.2.2…” implies the BGP RID of the neighbor is 1.1.1.1, with neighbor ID–the IP address on the local router’s neighbor command–of 2.2.2.2. The end of the output shows that the route is internal (iBGP learned) and is best, so both the > and i will be displayed for this route by the show ip bgp command. Finally, the output does not identify the local ASN, although it does list the AS_Path of the route (1, 2, 3, 4). Q4. A company uses Routers R1 and R2 to connect to ISP1 and ISP2, respectively, with Routers I1 and I2 used at the ISPs. R1 peers with I1 and R2; R2 peers with I2 and R1. Assuming as many default settings as possible are used on all four routers, which of the following is true about the next-hop IP address for routes R1 learns over its iBGP connection to R2? a. The next hop is I2’s BGP RID. b. The next hop is I2’s IP address used on the R2-I2 neighbor relationship. c. The next hop is R2’s BGP RID. d. The next hop is R2’s IP address used on the R1–R2 neighbor relationship. Answer: B. By default, when a router advertises an iBGP route, it leaves the Next-Hop PA unchanged. By default, R2’s next hop for routes learned from I2 will be I2’s IP address used on the R2–I2 neighbor relationship. Answer: A and C. The Enterprise core routers need to know which exit point (R1 or R2) is best; the correct answers supply those routes to the routers internal to the company. Note that redistribution from BGP into the IGP is not recommended, but it does defeat this particular problem. Q6. R1 is currently advertising prefixes 1.0.0.0/8, 2.0.0.0/8, and 3.0.0.0/8 over its eBGP connection to neighbor 2.2.2.2 (R2). An engineer configures a prefix list (fred) on R1 that permits only 2.0.0.0/8 and then enables the filter with the neighbor R2 prefix-list fred out command. Upon exiting configuration mode, the engineer uses some show commands on R1, but no other commands. Which of the following is true in this case? a. The show ip bgp neighbor 2.2.2.2 received-routes command lists the three original prefixes. b. The show ip bgp neighbor 2.2.2.2 advertised-routes command lists the three original prefixes. c. The show ip bgp neighbor 2.2.2.2 routes command lists the three original prefixes. d. The show ip bgp neighbor 2.2.2.2 routes command lists only 2.0.0.0/8. e. The show ip bgp neighbor 2.2.2.2 advertised-routes command lists only 2.0.0.0/8. Answer: B. The show ip bgp neighbors 2.2.2.2 advertised-routes command does list the postoutbound-filter BGP Update; however, the user did not issue a clear command, so the filter has not yet taken effect. As such, the output still lists the original three prefixes as if the filter had not yet been applied. Answer: B, D, and E. The neighbor distribute-list out command refers to an ACL, but for the ACL to match on both prefix and prefix length, the ACL must be an extended ACL. The neighbor filter-list command refers to an AS-path filter and cannot match based on prefix/length. Q8. Which of the following commands causes a router to bring down BGP neighbor relationships? Answer: A and B. The router resets the BGP neighborship when performing a hard reset of the peer. See Table 14-3 in the chapter for a list of several variations of the clear command and whether they perform a hard or soft reset.